Though the great German classical scholar Theodor Mommsen was probably unaware of it, he was the object of the passionate and enduring hatred of J. J. Bachofen, an obscure Swiss philologist in the provincial city of Basle. See the of this book before you purchase it. 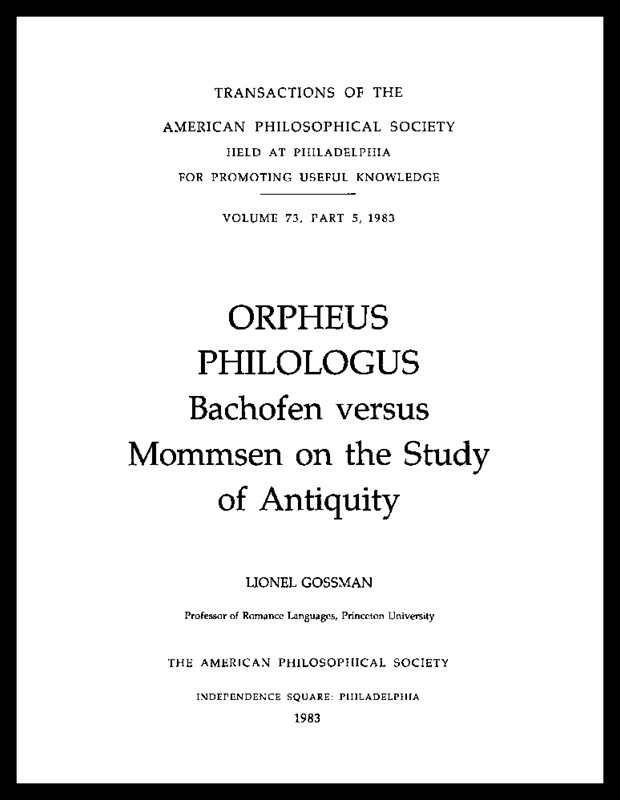 Bachofen, not well known in the English-speaking world, is mentioned by anthropologists for his contribution to the popular 19th-century theory of “matriarchy,” and by classicists such as George Derwent Thomson for his contributions to the study of Greek myth and tragedy. “I chanced on Bachofen, while working on the French historian, Jules Michelet,” author Lionel Gossman tells the American Philosophical Society. “Gender carries great metaphoric weight in Michelet’s historical writings and popular works of natural history. Bachofen highlights its role in ancient classical myth. “For both, the feminine signifies the body, the primitive, the unbounded, the people; it is the productive source of life, but also marks the eternal, mindless cycle of life and death. The masculine, in contrast, represents spirit, reason, law, and progress; but without the feminine, it is sterile. “Strikingly, Bachofen’s masterwork Das Mutterrecht (Mother-Right) appeared in the same year (1861) as Michelet’s best-selling La Mer, which is as much about the mother, the feminine, as it is about the sea. Entry filed under: APS Publications. Tags: american philosophical society, ancient greece, aps, basel, basle, classics, france, french, gender, george derwent thomson, german, germany, google preview, greek myth, greek tragedy, history, jj bachofen, jules michelet, la mer, lionel gossman, natural history, philologist, philology, preclassical, romantic, romanticism, scholar, swiss, switzerland, theodor mommsen.